I can tell winter is upon us because I am sitting at my desk having a cup of tea. There are other ways to tell, of course, such as going outside and feeling the cold, foggy mid-fifty degree weather. I know that the mid-50s may not be very cold, but seriously, just this last Monday I skipped out on my run because it was nearly 80 degrees outside! These temperature swings really throw my body for a loop. I’m generally a coffee person, but as soon as the weather turns cold, I can be found huddling at my desk with a warm cup of tea. There’s something so relaxing, calming, soothing and just plain wonderful about tea during the winter. Over the last couple of years, my favorite tea has been Lupicia’s Grapefruit Green. I got turned on to Lupicia’s teas when I received a couple of packages from my high school friend, Cindy. Cindy has been a big time tea drinker for as long as I’ve known her, so I knew that it had to be some good stuff. It was. I keep a package of Grapefruit Green or Sakurambo in my desk at all times. Except for today. I drank it all last week. I try not to be too much of a bandwagon hopper, but I must admit that it’s hard to resist when I see other bloggers telling me how amazing something is. So when I saw this on the sale rack at Safeway on Wednesday, I just tossed it into my cart and hoped that they were right. I was really apprehensive about trying it, as I am not a Celestial Seasonings kind of girl. I had a brief affair with their teas in high school, but once I found higher quality teas, I had a really difficult time going back. Since I was out of my favorite teas, however, I decided today would be a good day to try out the new flavor. The first thing I did was sniff the tea bags. I know. That sounds like a weird thing to do, but really, you can tell a lot from the smell of tea. I’m not an expert on the subject in the least. Frankly, I know very little about tea at all. I do know, however, that whenever I go to the Lupicia store downtown, I always make sure to look around at the different flavors and smell the ones that seem appealing to me. I can almost always tell if I am going to like something based on its smell. There are exceptions, such as brussels sprouts, but for the most part, my nose doesn’t do me wrong. 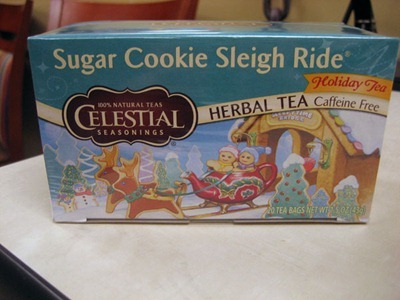 With Sugar Cookie Sleigh Ride, I was actually really surprised at how much it did smell like Christmas. I wouldn’t say it necessarily smelled like sugar cookies, per se, but it definitely had the holiday spice smell going on. I think it was the orange peel in it that I smelled. It was the scent of a sort of holiday spice cake. The aroma was pleasant, but I still wasn’t sure how I was going to feel about it. Once it had the chance to steep a little bit, I gave it a sip. I will drink it (and possibly donate some of the bags to the office kitchen), but to me, it was a little bit of a let down. It wasn’t overly flavorful. Sadness. Do you enjoy hot tea during the winter? What’s your favorite type? Do you like Sugar Cookie Sleigh Ride? I’m still looking for at least one more guest post for the first weekend in December. If you can lend a hand, shoot me a direct message on Twitter or leave a comment stating your interest and I’ll send you an e-mail. Thanks in advance for your help! I agree with you so much, I could have written this post myself, except that I haven’t tried the Sugar Cookie tea. I’m like you and am not a huge Celestial fan. I also sniff ALL my tea first! I was really hoping you liked the tea actually, haha. I bet I’d think the same thing though so I’ll skip it. Thanks for the non-recommend! I was hoping I’d like it too! Hot chocolate is full of awesome! If you come up with a warm, delicious sugar cookie drink recipe, you will be my hero. Yeah. I guess you’re right. Everyone does tend to smell tea. 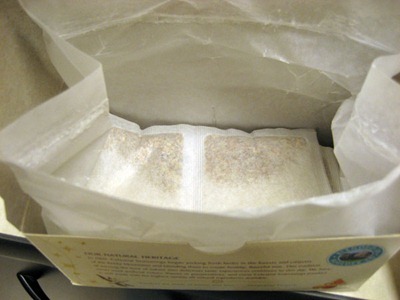 It’s just I felt a little self conscious at work, my nose stuffed into a Celestial Seasonings box. It’s like when they caught me photographing my CSA box on Thursday…embarrassing! Nothing wrong with smelling tea. It’s just what’s done. 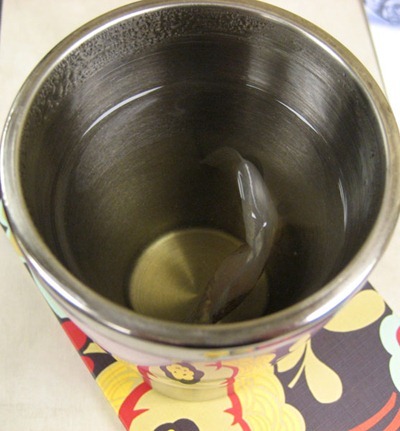 It’d be way weirder -NOT- to smell your tea.. I love fancy coffee and tea both very, very much. Like you, my at home hot tea consumption goes down in the summer and picks up in the winter, but I do drink a whole lot of cold tea to make up for it.. for coffee I drink 0-2 cups per day (usually just one in the morning.. but occassionally another when i meet friends out) but i go for the good stuff.